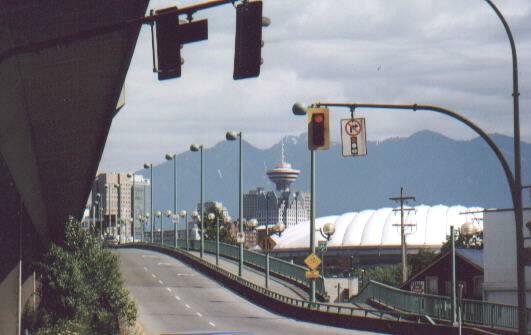 Picture of bike path along Cambie Street Bridge Vancouver, BC. Breath taking scenery. Heading south from downtown Vancouver, BC. having just enjoyed bicycle path of Cambie Street Bridge. Background is mountains, Harbor Centre Tower and the fabric roof for BC Place Stadium. Image taken early 2000s. Another image taken 2010. In Queen Elizabeth Park Vancouver, BC Ontario Street is a great cross city bike route. Nice and wide, goes all the way through, not too much traffic, but enough of a major artierial to provide stoplights as it crosses busy routes. An easy way to get from the Fraser River area to just east of downtown. Nice views along the way including these bicycle sculptures in Queen Elizabeth Park. This view looking north down Ontario St. toward downtown and north shore mountains. The joys of urban riding when planning is good. Base of sculpture up close. Plaza. Sculptures are located at Ontario and 37th Ave.
My favorite bike route from Vancouver to Bellingham,WA.